Today you will learn about the preparation step which is not compulsory but recommended as it helps you free up space and your conscious and gives you the feeling of being renewed. You also will learn about the first step which is “define the wish/wishes”. So, I am not going to stall for time anymore. Let’s start our journey to come-true-wishes-land. The preparation step or pre-task is the process of getting rid of your old stuff. I can explain why this step is so important to start working with your wishes. You probably know or have heard that if you want something new to come to your life you have to empty space for it. Purging things is good for your emotional state. We are usually keeping many needless items “just in case” or “will through it later”. Forget about this. You do not need your old clothes 3 sizes smaller than you are, cracked mugs, cups, and plates, books that you will never read again, and anything that does not bring joy to your life or practical use. Indeed, it makes you feel better, you declutter and free space for something new. If it is a problem for you then you can use some tips from Sydney’s article: “How to get read of stuff when you’re really, really bad at it“, they might be useful. Of course, I know that there are sceptical people who would ask “Why”, there is an example which is quite relevant here. Do you remember a hot air balloon? One of the main conditions for it to fly is to get rid of ballast. So, when you are throwing away all the excessive stuff you do not actually need, you make yourself easier for moving on to the next step and fly to your dreams. I would advise you to take a huge rubbish bag (you can choose not only a black one but and nice colour like a yellow one, this should make you feel better) and walk around your home. Every room and even kitchen has to be inspected and all the stuff you always leave for later should be collected. Be wise and do not throw everything into your rubbish bin. You can donate your old clothes or put on sale or ask antique shops if they are interested in any of your items. Help somebody or earn some extra money can’t hurt. I also convinced that anybody has such things and do not tell me that you don’t. Firstly, I would recommend you to write a list of your wishes, let’s say 10. Do not limit yourself. Do not think: “I want a detached house in the pictures village but I can allow myself only semi-detached property in the city, so I wish for the later”. That is not right, you have much more potential and energy for your genuine wish. Be ready to change your list later as we are going to work on your genuine wishes and all you will write in your first list may be quite possibly changed. Secondly, it is important to be concrete while formulating them (meaning that you have to write names of those who are in your wishes, sums if we are talking about money, places if it’s about travelling or dwelling). Thirdly, all the wishes have to be made positive. It is easy to explain on the children. When you tell them “do NOT do that”, they do that just because they want to understand “what is what” and “how to”. This particle “not” exists but our conscious perceives positive statements. I can tell you “not a dog” and a dog will be the first thing appeared in your mind. Fourthly, your wish should not be harmful to others, try to avoid wishes like illnesses or troubles to others. Steal somebody’s husband or a million dollars from a bank are bad ideas to wish. And the last one is to make a wish from yourself. You do not decide for others. The wish will come true if it is from you and for you. However, there is one trick. You are allowed to make a wish through yourself. Compare: “I wish my parents to be healthy” and “I wish to be a daughter of healthy parents” or “I wish my husband to be a rich man” and “I wish to be a wife of the rich man (do not forget to put the name if you know specifically who you want)”. You should wish only from your own emotions and wants. Moreover, when you wish through yourself about other, it is crucial that person has the same wish. I will explain. Even if your wish is written right (“I wish to be a wife of the rich man”), it may not come true if your husband is sure that he is a rich man. I this case your wish seems to have come true. Just be careful what you wish for. Oh, one more thing, try to make your wish as a result. Compare: “I want a renovation in my house” and “I want to have my house renovated”. Imagine that you have what you wish. It is actually better to wish in the present time. I think that is it for today. Hope you will find enough motivation to try this with me. 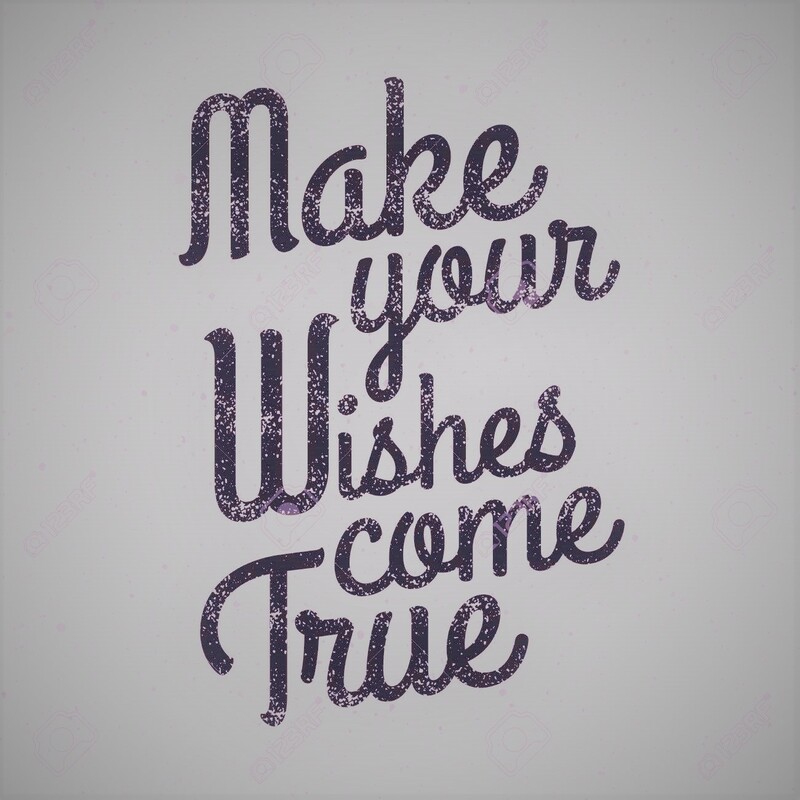 LET’S make the WISHES to COME TRUE! P.S. Please do ask me questions if you have any, I would be glad to answer. Next Заставь свои желания исполниться. Шаг первый.